saving western civilization one student at a time! Today I heard my daughter approaching in the darkness, too early for a Saturday morning. I asked her to tell me what happened. “An episode.” With schizophrenia, this means threatening voices and shivering in bed with a paralyzing terror. Michelle’s saying reminded me of the Holy Scriptures. 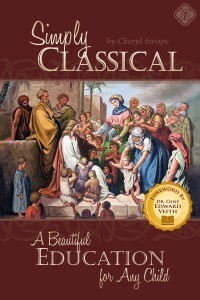 Share in Michelle’s full story and find encouragement for bringing a classical Christian education to your special-needs or struggling students: Simply Classical: A Beautiful Education for Any Child by Cheryl Swope, M.Ed., with Foreword by Dr. Gene Edward Veith. Originally Published in The Classical Teacher Summer 2014 edition. Cheryl L. Swope, M.Ed., married 25 years, has a master’s degree in education: Learning Disabilities and a bachelor’s degree in education: Behavior Disorders. Cheryl and her husband home-schooled their 21-year-old adopted special-needs boy/girl twins (both with autism, learning disabilities, and mental illness) from the twins’ infancy with classical Christian education. She holds a lifetime K-12 state teaching certificate in the areas of Learning Disabilities and Behavior Disorders. She has worked with special-needs children, youth, and adults for over thirty years, Cheryl is an advocate of classical Christian education for special-needs and struggling students. The love of history, music, literature, and Latin instilled in her own children has created in Cheryl the desire to share the message that classical education offers benefits to any child. What Is the Classical Approach to Phonics?